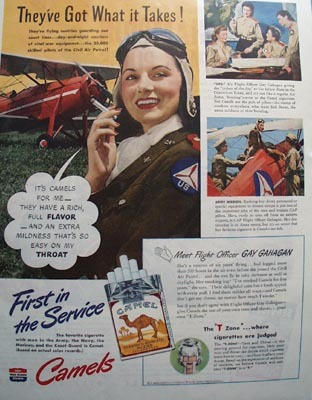 Camel First In The Service Ad 1943 This is an October 2, 1943 advertisement. It is a nice color ad from Camel Cigarettes. Pictures Flight Officer Gay Gahagan standing near her plane and smoking a Camel She says, It's camels for me. In mint condition. Photo is taken through plastic and may show wrinkles or crookedness that is not in the ad. This magazine tear sheet measures 10 1/2"" wide by 13 3/4"" tall. Items Similar To "Camel First In The Service Ad 1943"